Welcome to Perfect Pieces. We specialise in Troika Pottery and retired PenDelfin rabbits and also stock a range of other 20th Century British pottery, ceramics and collectables. We have been trading online for over 10 years and regularly ship items all over the world. We have a specialist Pendelfin rabbit stoneware section, with an extensive selection of rare Pendelfin rabbits, Pendelfin display stands, Pendelfin Family Circle Club membership pieces & PenDelfin brochures. Our special offer item is this very lovely and practical Poole pottery Carter Stabler & Adams Sylvan Ware dish. 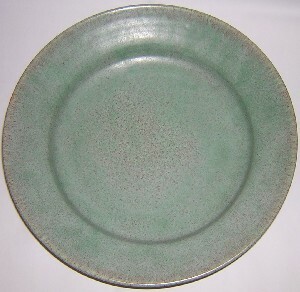 This early Poole Pottery dish dates from c1934 to 1937. It is in excellent overall condition. A lovely early and simple piece of Poole Pottery. Each piece of pottery we offer for sale is illustrated with several large photos, and includes a detailed condition report and description. Pottery histories - brief histories of many well-known British potteries. Please feel welcome to browse our site, and do not hesitate to contact us if there is anything we can help you with.